Last year a self-confessed stationery addict who reads this blog contacted me and corresponded a little about her eclectic collection of mechanical pencils. With a little encouragement, Sandra agreed to do a guest piece on some of her pencils, so here’s her article on some pencils that came from her great aunt. The inherited pencils – with standard wooden pencil for size comparison. I am not a technical person and how these things were made was less interesting to me than their ability to evoke aspects of everyday life in the late 19th and early 20th centuries. Pens and pencils were things used constantly by thousands of people in 1900. But many of these late Victorians and Edwardians would have understood that their grandparents might only have dreamed of the education and literacy which would make carrying a pencil with you a normal thing to do. The design of many of these old pencils reflects not only the tastes of a different era but also links through to the way people dressed and the way they conducted their lives. For example, this was an age when no man would consider himself properly dressed without a jacket and a waistcoat – and the ring on the end of some pencils could have been used to attach the pencil to the watch chain which adorned almost every waistcoat. There, it rested safely in perhaps the opposite pocket to your watch, if you wore a double Albert, or even in the same pocket - ready to hand when you needed it. 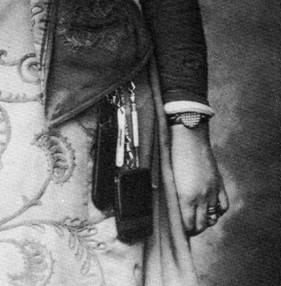 Women’s clothes in the 19th century had far more pockets in them than they do now – the watch and chain was not exclusively a male adornment, as this picture shows. 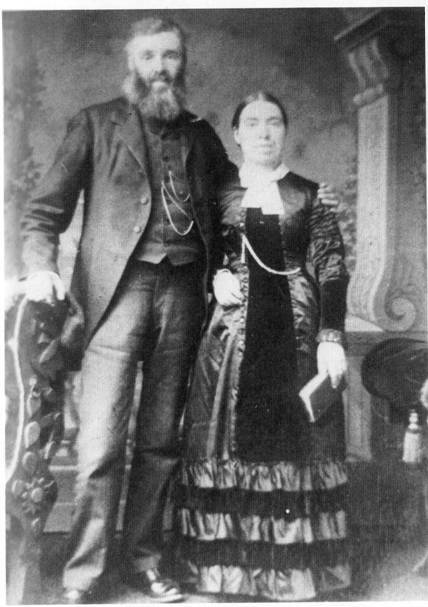 A wedding picture taken in 1877, earlier than the date of my pencils but giving an idea of how some watch chains were worn -from a button hole to a waistcoat pocket or in the woman’s case a pocket made at the waist of her dress. 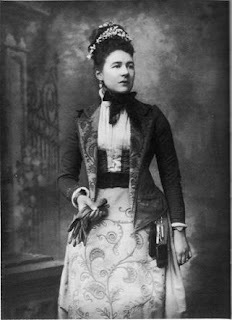 from Vanda Foster, ‘A visual history of costume:the 19th century.’ by Vanda Foster. In an age when there was no telephone, but when a postcard dispatched before 9am from your writing desk in the library or morning room would be delivered to someone in the same town before noon; when sending written messages was as normal and as frequent as sending text messages is now, a pencil or pen was a very useful thing to have about your person. As far as I am concerned – it still is! Two of my pencils are examples of one-ended combinations. That is, they contain both a pen and a pencil. 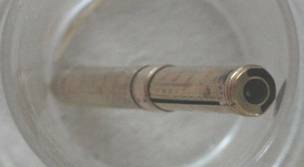 To use the bottom pencil, you twist the lower half of the barrel to make the pencil nozzle emerge from the centre of the barrel. Leads are fed in through the nozzle end of the pencil. The small cap at the other end of the barrel unscrews to give you a space in which to keep spare leads. You can retract the pencil and then use the sliding collar to push up a nib holder for a steel dip-pen nib. 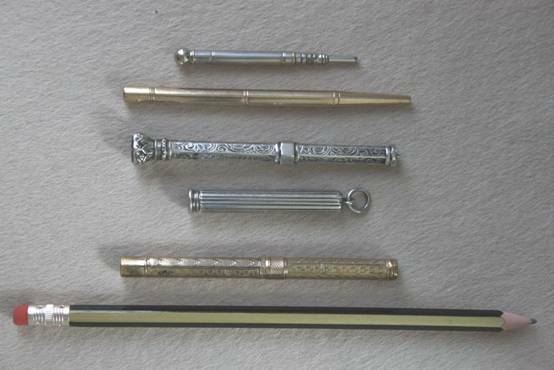 This comes out of a slot in a collar which encircles the business-end of the writing instrument. I think this is gold-plated as it has no hall marks on it and it is showing small areas of wear – but it doesn’t seem to need polishing! The other example in the picture also includes both a pen and a pencil. It has a slider pin in each side of the inside, plain barrel – one to push out the pen and the other to push out the pencil. In this case the pencil comes out towards one edge of the barrel opening and the pen towards the opposite edge. This example as well as allowing you to slide both writing instruments down inside the plain part of the barrel, then allows you to slide this whole assemble inside the ribbed end of the barrel. (As in the first picture). The ring at the end allows you to hang it from your watch chain from or from your chatelaine. It’s a white metal, but not silver. Both pens with pencil showing. Both pencils with nib showing. This type of design with pen and pencil at the same end was popular right into the 20th century and I suspect the gold-coloured one is later than the other one. The pencil below, however, I think is probably a late Victorian one, largely because of the heavy chased decoration and the weight of it. The knurled collar at the base of the nozzle of this pencil should make the lead advance – but at this point in time it doesn’t work. The sliding collar on the barrel retracts the end of the pencil. So ‘pocket-safe’ is not exactly a new idea. Electronics apart almost everything you think is a modern idea – the Victorians probably got there first! There is no hallmark on the pencil but it looks and feels like silver and it tarnishes slightly if left for any length of time. I suspect that this pencil has been well-used at one time as the whole pencil has a slight curve along its length. This is a small pencil with a spherical finial. The whole of the nozzle end, beyond the part of the barrel with parallel sides, twists to advances the lead which is quite thick and is fed in from the writing end. It is only 6cm (2.5 inches long) and the thin covering of white metal has worn through in some places to what looks like a brass inner sleeve. A handy thing perhaps to keep with a notebook in your desk, or in a writing case, or it may even have belonged in an etui. This slim gold pencil is, I think, newer. Although these are my most treasured pencils - because they are family things - they are not of course the only ones. Either you have the collecting gene or you don’t – and I can’t even imagine what it’s like not to have it! I’m not the sort of person who has to have every example of something, but if its interesting or unusual or appealing, in short if it tells me very plainly ‘Take me home’, then who am I to argue? 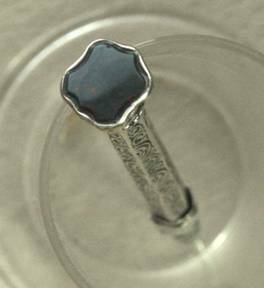 “In Anglo-Saxon England women carried their needlework implements in cylindrical metal boxes, about 3 inches in height and 2 inches in diameter, suspended from the girdle. . . In the domestic life of the period, and for many centuries to come, there was little provision for the safe storage of personal belongings: privacy as we understand it was quite unknown. Small, individual possessions were therefore, of necessity carried on the person. Not only sewing implements but keys, pomander, seal, pen-knife, swung from the waist on chains or cords. In recent times Keir from Scotland has slung his bagpipes over his shoulder, hitched up his kilt and gone exploring through the bazaars of the United Arab Emirates, and it is fair to say he has found many bargains to haggle over with the mechanical pencil merchants of Dubai and Abu Dhabi. Keir has been feeding his strange and growing Rotring obsession, finding such delights as brand new dusty old Rotring 900’s still sitting on shelves…neglected…just waiting for a pencil person to recognise and rescue them. Keir took pity on poor me, far from the bazaars and sent a package of goodies my way. Amongst the exotic contents of the package was a strange looking little pencil which immediately caught my eye…the Schneider iD mechanical pencil... that short, sharp, tapering yet fat body, the very antithesis of many a long sleek drafting instrument. Vast expanse of shiny chrome on matt black rubber body, fluorescent end cap, this pencil is making a statement and it certainly looks interesting, sitting on a desk. Right time to pick up the iD. As expected it is rather weighty, 32 grams according to my kitchen scales. The body tapers so you can hold it fairly low down or high up as suits you, and it also has a large scallop taken out of it as part of the ergonomic design. I’ve got to say the body scallop and general size of the iD just didn’t suit me for long term writing. The scallop just didn’t seem to be of any particular use or relevance to me. The thickness of the body meant I wanted to try and grip the iD fairly low down and the body scallop contour appeared to be too high up for me. Even gripping the body low down it was basically still too wide for me, long term. However, having said that it didn’t suit me for long term writing, I feel completely the opposite when it comes to short term use – like writing a shopping list, writing down a phone number, a couple of quick notes during a telephone conversation, jotting the notes for this review in my notebook and so forth. As a pencil to have lying around to grab for short term use, the iD is well worth consideration, a definite competitor to the Lamy Scribble. Whilst I generally prefer thinner leads, the 0.9mm of the iD is acceptable for quick notes and doodles. Take a look at that pocket clip. It is chrome plated steel, surprisingly springy and very unusually shaped. On the one hand it works quite well, but because the clip is so wide and wraps around the body it needs to bend whatever it is clipped to. So, it’s not so good on thick papers, etc. Note the lanyard eye at the top of the pocket clip. A rather rare thing these days. Neither the pocket clip nor the body scallop effectively stops the pencil from rolling on your desk, although they do try and partially succeed. The lead advance mechanism is a twist top ratchet. The coloured end cap twists about ¼ turn to advance the lead. Naturally it springs back of its own accord. Ten activations will get you about 5mm of the 0.9mm lead. Although it is possible to do it one-handed, advancing the lead on this mechanical pencil is really a two handed job and thus a definite interruption to the writing process. The lead sleeve is a short tapering cone and retractable for pocket safety. Refilling the leads is a little unusual too. I certainly expected that big end cap to pull off, but it doesn’t. To refill the lead magazine you unscrew the tip section from the main body and pull the whole mechanism out. Of course since the end cap doesn’t come off, there is no eraser beneath it, or anywhere else for that matter. Markings on the mechanical pencil are “iD” printed on the body near the tip of the pocket clip, and “Schneider Germany” is moulded into the black rubber body at the top of the body. Now, the use of the word “Germany” does not necessarily mean ‘Made in Germany’, which I find rather misleading at times but there's no subterfuge or hidden origin here as the Schneider iD webpage states “Writing comfort and quality ‘Made in Germany’ ”. Overall then, the Schneider iD as a very interesting mechanical pencil, and I’m very grateful to Keir for sending it my way. Thanks buddy. • Not So Good Points – personally the body is too wide for prolonged use. Dimensions – Length 123mm, diameter 21mm at widest point. Balance point about 60mm up from the tip. Do you need to do some decorating? Fear not, Wes Z has come to your aid with some wallpaper. Image copyright Wes Z, used and made available for copying with his permission. 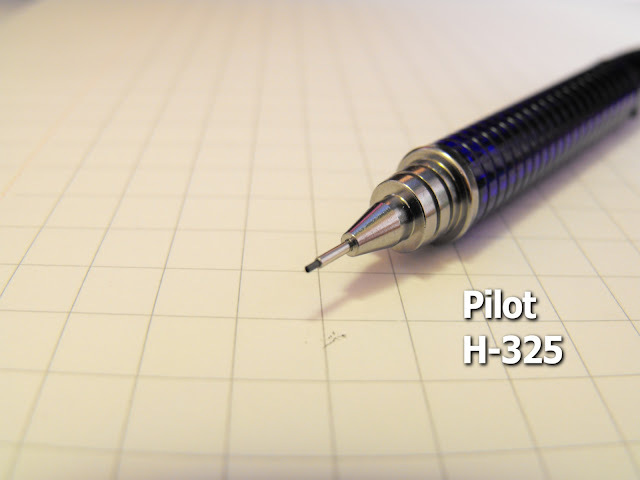 It's his Pilot H-325 and the image is 1600 x 1200 pixels. Hopefully if you click on the image you will get a full size high resolution copy that you should then be able to download, save and use as your screen background. Right then, it is now early May 2011 and one year is up. As noted above, Paper Mate claim the pencil should biodegrade in soil in about a year, so let’s go out to the garden. The herbs and flowers are looking quite nice, especially those red capsicums (bell peppers) towards the far end. Push aside the mint and parsley to find the Paper Mate stuck in the soil as a grave marker. Now dig down a bit to find the body. Here’s the body and the marker, fresh from exhumation. Now let’s give them a good scrubbing in some lukewarm water with detergent to remove as much dirt and grime as possible. Those barcode labels still look pretty good! Where are the tips? That’s interesting. They were definitely buried with the main bodies but are now nowhere to be seen. I can only guess they have biodegraded away!? As for the main bodies though…well there doesn’t appear to be a lot happening. There’s no question the bodies are being eaten away by micro-greeblies and such. The parts stuck in the soil are no longer nice and smooth. They are rough and pitted, looking almost sort of fibrous. My photographic skills aren’t really up to the job, but hopefully the two images below will give you some idea. It is interesting to note that the grave-marker pencil has only been attacked from the soil-line down. It is basically as good as new above ground level despite being outdoors for a year. Equally interesting is that the barcode label has protected the surface of the buried pencil. The body surface directly beneath the barcode label has not started to degrade like the rest of the body. At the start of this little experiment the two test pencils weighed in at 16 grams. After 1 year they now weigh in at…14 grams. So they have lost 2 grams of material in a year. Most of that would be the two tips which have gone missing. I can only assume those much smaller sections with much greater surface to volume ratios have been eaten away quicker? Either that or grave-robbers. Whilst there’s no question these pencils are starting to biodegrade, I really must question the statement that these pencils will biodegrade “…in about a year”. Personally I think my garden counts as “normal temperature conditions found in soil/home compost”. I have been rather slack lately and not updated the blog with some more reports of 5th Birthday Giveaways in their new homes. So, my apologies to Viperman and Jack. First then here’s a photo and a few words from Viperman on his winnings – the Faber-Castell eMotion Pen-Pencil set. Secondly, from Jack, we have the Ancient Kauri pencil in its new home. Thanks guys. Glad you liked your winnings.